I have so many skincare products that I love that not enough people talk about. 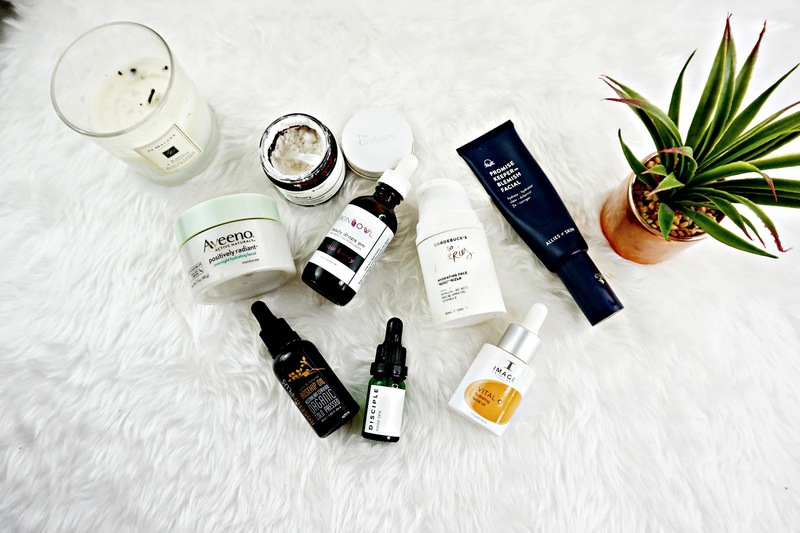 So today I wanted to share the skincare products that I think are so underrated. For reference I have dehydrated skin. I've tried a few things for image skincare and this oil is the most recent addition. I've been using this for a couple of weeks now and I'm so impressed. This is from their Vital C line that's packed with anti oxidants. This line is aimed at those with dehydrated or sensitive skin that is easy aggravated by the environment. This oil is so hydrating. It's quite rich so it feels really nourishing on the skin. It does take a while to absorb so I like to use it at night. It leaves my skin feeling so soft, plump and it looks clearer. Plus this smells devine! I've seen really great results from Vitamin C and this powder is pure L-Ascorbic acid which is a form of Vitamin C. This is a little faffy to use because you have to mix the powder with another product. I've been mixing it with my Klairs Supple Skin Preparation toner. But the results are incredible! From the first use my skin looked so much brighter and felt a lot smoother. I've been using this 2-3 times week for a while now to keep my skin looking bright and clear. This is so cheap so I'm surprised more people haven't been raving about it. Dr Roebucks as a brand is underrated in my option. They have some amazing products. This moisturiser included. It's become my favourite day time moisturiser. It's so light weight and absorbs really quickly without leaving my skin feeling sticky or tacky. But this is so hydrating. It keeps my dehydrated skin hydrated all day without making it oily! It's perfect for this heatwave. This is leave in mask that fights blemishes while you sleep. It uses AHAs and antibacterial Collid Silver that all work together to decongest pores. This stuff is amazing and really helps to clear and prevent any breakouts. I don't use this everyday, I use it when I have any spots and if I can tell any are on the way. It really helps to clear them up quicker. I love how hydrating this is to. And it leaves my skin overall, looking brighter, clear and so smooth. This does contain AHAs but this is so gentle you can't feel it working and it's not uncomfortable but the results are brilliant. Skin Owl is another brand that I think is underrated as a whole. The whole brand offer natural, fragrance free skincare solutions. This oil in particular is incredible. It's main ingredient is Maqui Berry which is a super berry packed with anti oxidants. It's also a brilliant source of Vitamin C. The anti oxidants work overnight to sooth, heel and replenish the skin. This is designed to be used in place of a night moisturiser. I love how my skin looks and feels after using this. It feels so soft and smooth to. I picked this up on a whim when I was in New York and I'm gutted that the Aveeno Skincare line isn't available in the UK. You can buy it on Amazon here though. But this is one of the best moisturisers I've ever come across and I know that is a bold claim. But this just does everything I want it to. It deeply hydrates my skin, leaves it feeling soft and smooth without irritation. From time to time I get this weird texture issue on my skin that isn't quite spots, they're just weird lumps but this cream always seems to clear it up within a couple of days. I can't believe more people don't talk about this. I do plan on doing a more in depth review of this oil but I wanted to give it a mention here because I've been loving it and I haven't heard many people talk about it. It's a wonderful blend of essential oils, fatty acids and bacteria fighting probiotics. All of which work together to sooth and hydrate and replenish the skin. This is aimed at people with stressed out skin which I don't overly think I have. But I've been loving this oil none the less. It has a silky smooth consistency that absorbs almost instantly into the skin. I like to use it at night. It leaves my skin feeling so smooth, hydrated and plumped. It's a great little oil. Last but not least I have this Rosehip oil. Rosehip oil has a range of skincare benefits. It's rich in Omegas, essential fatty acids and anti oxidants. It can help sooth dry dehydrated, fade marks and stretch marks as well as improving the skins overall health. I've been really enjoying this one from Rosehip Plus. It instantly adds hydration to my dehydrated skin. I also have a few Red marks on my skin that I'm hoping this will help fade. While I haven't noticed a dramatic improvement in them yet the overall look and feel of my skin is better. Have you tried any of these? What are your favourite underrated products?